Welcome! Thank you for volunteering to assist your company and United Way by being the Campaign Coordinator. Your job is very important to the overall success of our annual campaign drive. Hundreds of individuals across Niagara County are playing the same role that you are to assist those in Niagara County who need support. This page was created with you in mind. We hope to be able to answer questions or give you ideas on how to make your company's United Way campaign the best it can be. Click here to review the campaign coordinator guide. Each year, we see United Way volunteers and staff members put on their campaign hats and venture out to raise money for the organization. Most of us attend meetings at our places of business, and many of us generously open our hearts and wallets. We do this with confidence, knowing that our money will go toward a “good cause.” We know United Way does “good things” for the community. But how much do we really know about the organization and about how our donations are being spent? 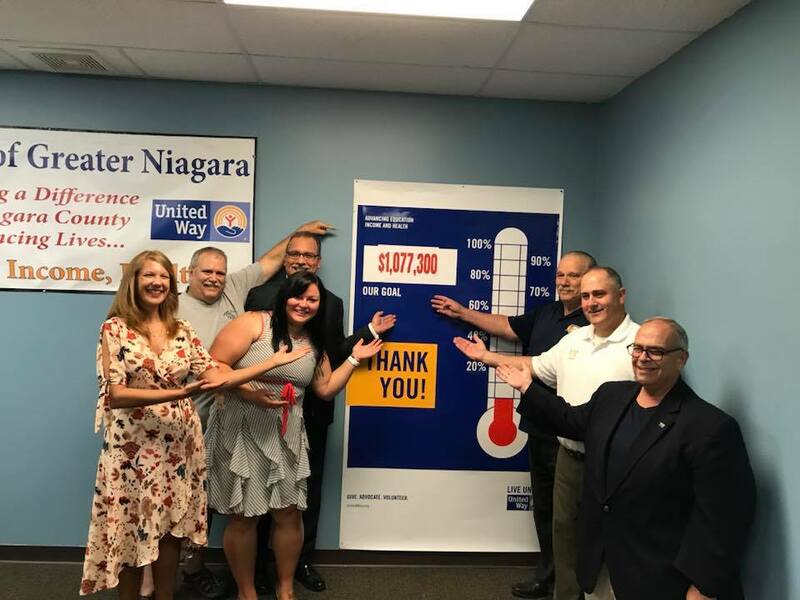 United Way of Greater Niagara is a non-profit organization dedicated to improving the lives of people in Niagara County by addressing critical human needs. The organization is unique in that we collaborate with 25 partner agencies to affect positive changes in Niagara County as efficiently as possible. When non-profit organizations work together, not only can more good be accomplished, but also the cost of fundraising is dramatically reduced, leaving more money for what is important: “helping people”. In fact, 82 cents out of every dollar donated to United Way goes to programs or services who help people. Volunteers & Interns from around the county visit United Way’s partner agencies to evaluate their effectiveness and make funding recommendations to the United Way Staff & Board of Directors. It is a sound investment for your company. United Way’s knowledge of the community ensures contributions are channeled to where the needs are greatest. United Way can help you develop a customized fundraising campaign that aligns with the values and interests of your organization and your employees. We also support in building your fundraising team and running a great campaign. Convenience and affordability in giving options such as payroll deduction. We process all donations, eliminating the need for a third party pledge processor that lacks the ability to bring year-round, community-wide recognition to you and your employees. When your employees donate to United Way, 100% of their gift will be invested to help those in need. Special recognition benefits for donors who give $1,000 and more annually. United Way of Greater Niagara Announces its 2018 Campaign "Give Your Way With United Way" that will take place from August 8th to November 30, 2018. “United Way serves the needs where they raise the money. This truly is neighbors helping neighbors. Your money stays local and is put to use by people who understand how hard you work for your money and are determined to put every dollar to good use. As a member of the Board of Directors, I know the scrutiny put into making sure your donations are used effectively”, said William Tiger Campaign Co-Chair”. “I am honored to be a Co-Chair for the United Way of Greater Niagara Campaign because they help people who need help in our community, I’ve personally seen how United Way works when my people from the different Unions fall on hard times and United Way and their agencies are there to help, said Jim Briggs, Sub Director of United Steel Workers & President of the Niagara/Orleans Labor Council”.